Nice South Monroe County Home on 2 Acres, county Water. Ready to move in! Fresh paint and new hot water heater,storm door and exterior light fixtures. Lots of space for the $$. COUNTRY LIVING WITHIN MINS OF THE CITY!! !This 4BR/3BA beauty showcases a rocking chair front porch and sits on a massive 2.27 acre lot. The home opens to a warm & inviting LR w/wood burning FP, high ceiling, & judges paneling. The kitchen has it all w/tiled flooring & backsplash, island, eat-in, pantry, & a full appliance package only a year old. The lrg MBR offers recessed lighting & a walk-in closet & a MBA w/dual vanities, jetted tub, & a beautifully tiled floor to ceiling shower. Extras p/fence & deck. Adorably Cute 3 Bed 2.5 Bath Home Sitting On Elevated Lot Just Off Of Wimbish Road Centrally Located Close To All Of North Macon’s Amenities Featuring Granite Counters & Stainless Appliancest, Large Foyer Entry, Spacious Back Deck, Gorgeous, Large Front Yard, Open Floor Plan From Living To Kitchen, Separate Laundry Room, Breakfast Space, & Single Garage. Not much Left To Be Desired In this Cozy-Cute New Listing. Priced To Sell. Large Mobile home, (pined foundation) split bedroom plan, 3 bedroom 2 baths. Hardwood floors in living area and carpet in bedrooms. Large fenced yard. Deck off kitchen area. Laundry room off hall. Grea condition ready to move in. Lot is included (not leased). Located across form the college. Please call Jason Atkinson at Robins Finacial to qualify 478-322-7538 x4422. 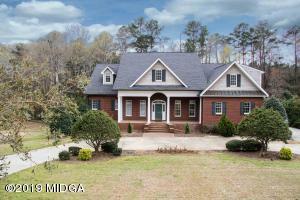 This beautiful 3 sided brick home is a 5 bed 3 bath. This property features a gorgeous open kitchen, newly installed hardwood floors with a large deck in a cul-de sac neighborhood. It has built in shelf for each closet, office space & so much more. Large back deck area great for family outings, and a Golf cart path so come on and bring your golf cart! But wait there is more! The property also has a ready stubbed basement, that can be finished into a 3 bedroom, 1.5 bath with a living/family room and a huge bar & sink room. 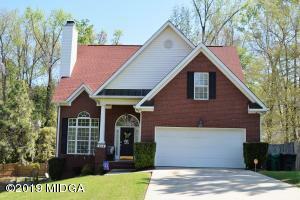 Come check out this beautiful home within some AMAZING school districts. This high-end home has been transformed with new roof by L.E. 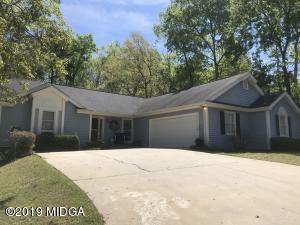 Swartz, new updated paint colors chosen by Macon’s premier home stager, some new light fixtures, carpet upstairs is less than 2 years young, along with refrigerator, cooktop and upstairs air conditioning. 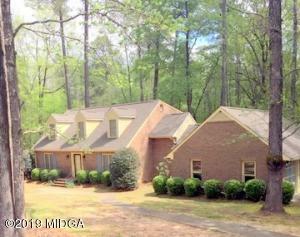 Brick home on all four sides, screened-porch, large laundry room measuring 14×12+ on main level. Finished basement with game room, bar, fireplace, bedroom and bath plus stage for children’s skits. Not only is the master bedroom on the main but an extra bathroom and guest bedroom. Hardwood floors in Dining room, den, keeping room, kitchen and breakfast room. Seller will allow $10,000 for new flooring in basement so that buyer can choose between carpet or tile. A pleasure to tour and see. Lovely one level home on cul de sac. Split bedroom floor plan. Nice master suite with large master bath. Deck overlooks wooded back yard – lots of privacy. Oversized garage. THIS HOME FEELS LIKE A LUXURY AIR BnB IN THE MOUNTAINS BUT CAN BE YOUR OWN PRIVATE RETREAT. With three levels, you have space for everyone & not feel cramped. Master Bedroom is on the main level, three bedrooms & office space on second level. Fully finished basement makes great man cave, or in law suite w/ dining area, 2 LR areas, Bedroom & Full Bath. Space to convert one LR area to Kitchen if needed. Deck off kitchen overlooks backyard that has privacy fence. Make the call to see today!